You can purchase the complete Kids' Wings 23-page Unit for The White Elephant by Sid Fleischman and the 22-page Unit for The Ballet of the Elephants a true story by Leda Schubert NOW for immediate download for only $15.95! In this story, Sid Fleischman works his unique magic into his words through vivid description, figurative language, and a story filled with compassion and perseverance. Wide-spaced lines and short chapters invite even younger readers to step into this story, ride along with Run-Run, and once again, find themselves transformed into another place and another time. 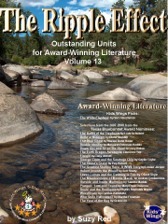 A 23-Page Unit for The White Elephant is a part of a collection of 40 units in The Ripple Effect. Buy The White Elephant by Sid Fleischman NOW! 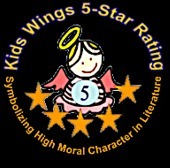 Texas Bluebonnet Award is a service mark of the Texas Library Association, which is in no way affiliated with Kids' Wings or Suzy Red. Use of the Texas Bluebonnet Award mark in these materials does not imply any endorsement of any kind on behalf of the Texas Library Association. The Texas Bluebonnet Book Master List was selected by the Texas Bluebonnet Award Committee of the Texas Library Association.